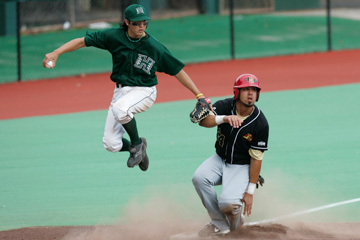 Mid-Pacific alumnus Jonathan Hee has started the last two games at third base for Hawaii. Jon Hee spent more time in the weight room than he did playing baseball for Hawaii during his first two seasons with the Rainbows. That dedication was necessary. He weighed about 155 pounds when he graduated from Mid-Pacific Institute. Hee now carries 170 pounds on his 6-foot frame. The hard work has paid off. When: Today and tomorrow, 6:35 p.m.; Sunday, 1:05 p.m.
Hee started the first two San Diego State games at second base, then switched to the hot corner the last two games. He was 4-for-12 (.333) with a triple, six runs scored and two successful stolen base attempts. But, it took two years for him to get where he is this season. "Jon needed to get bigger and stronger. It was to help him at the plate. At times he was overpowered, but you knew it was going to come because of his work ethic," said UH coach Mike Trapasso. "Jon had the same defensive ability then he has now. Hee was recruited by Hawaii-Hilo and Pacific and was planning on playing for the Tigers until UH entered the recruiting picture during the second semester of his senior season at Mid-Pacific Institute. The decision to change his mind was not difficult. "It was a chance to stay home. There is nothing like playing in front of the home crowd," Hee said. Playing wasn't in the cards his first year. He redshirted, but was glad the coaches made that decision. "It's a big jump from high school to college. The game is a lot faster. I learned a lot just from being around the other players and the program," said Hee, who contributed by keeping charts of the opponents' tendencies and how the Rainbows executed on the field. He was in the weight room every day, working with former MPI and UH teammate Isaac Omura. Hee took up summer ball for the Wenatchee (Wash.) AppleSox in 2004. It gave him the chance to play every day and catch up after a year without competition. He saw spot duty a year ago for the Rainbows, appearing in 21 games, getting 21 at-bats and four hits for a .190 average. Recruited as a third baseman, Hee is a true utility infielder. He can play second and short and also handle first, although Trapasso would never use him there. Where Hee settles this year remains to be seen. "Jon is our best defensive player at any position. He never complains, never does anything but work his tail off, always trying to improve," Trapasso said. "He is turning himself into a team leader and a prospect, all because of the character he has. He always puts the team first. It's a cliché, but he's the first guy here and the last guy to leave." Hee credits coach Keith Komeiji with making some little changes in his swing that have made a difference this year. "It took a while to get the changes to work. I understood what I needed to do, but it was a matter of applying it. I finally felt like I was executing during the fall intrasquad games," Hee said. Hee has no preference what position he plays as long as he can help the team. Hee also doesn't let a tough at-bat affect his defense. "If you aren't doing one thing right, you better do the other thing right," Hee said. The sophomore says he is not goal-orientated, but just goes with the flow. He relaxes before a game by listening to slow music. His favorites are John Mayer and Marvin Gaye. Hee wasn't sure what he wanted to do post baseball when he enrolled at UH. "I was a business major but I've switched to speech pathology," he said. "My sister did an internship at the Kapiolani Medical Center for Women and Children. I shadowed her for a day and it looked interesting and fun. Working with children, that's what I want to do."